Don’t misunderstand: we, at Catholic Truth, are not in favour of the concept of “hate crime” (we hate it!) but our rationale differs somewhat from that of the Scottish Bishops, it would seem. We are clear: we must be free to preach Christ, undiluted. And that entails appearing to be intolerant and illiberal in the sense understood by our unbelieving world. The Bishops appear to be backing away from their previous claims about anti-Catholic prejudice, in the interests of not annoying their ecumenical partners and appearing to be “liberal” and “tolerant” (of sin, error, heresy, you name it). Given their previous statements on the subject, however, the question remains: IS Scotland an anti-Catholic country… or not? And if the answer is “yes”, we’d like to know exactly what the Bishops intend to do about it… What can they do? Ideas welcome…. The third LGBT+ Catholics Westminster Pilgrimage to Rome ended yesterday, Sunday, 10 March 2019. On Ash Wednesday, the 16 pilgrims, including parents and family members, alongside LGBT_ Catholics with Pilgrimage Chaplain, Fr David Stewart SJ, attended the morning General Audience with Pope Francis in St Peter’s Square. At the end of the Audience the group was invited to meet Pope Francis. 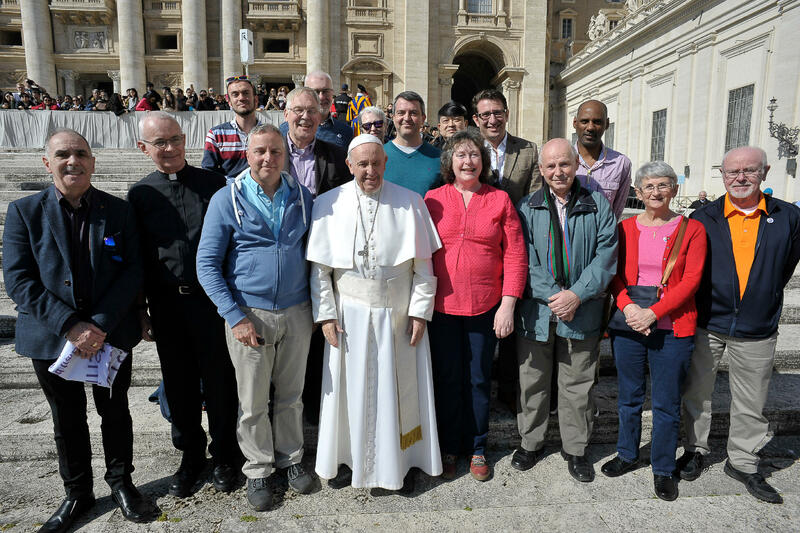 The Pilgrimage Leader, Martin Pendergast, a member of the LGBT+ Catholics Westminster Pastoral Council, introduced the group to the Holy Father, explaining that they formed part of the LGBT+ pastoral ministry outreach of Westminster Diocese. Each pilgrim received a gift of a rosary from Pope Francis who shook hands with the group’s members. Later, on Ash Wednesday afternoon, the group was able to take part in Pope Francis’ Mass and Imposition of Ashes in the Church of Santa Sabina. In the evening they was warmly welcomed at an Ecumenical Liturgy of the Word & Blessing of Ashes with English-speaking Anglicans, Catholics and Methodists, in the Church of St Ignatius. The programme included a conversation with Rome-based journalists, Christopher Lamb (The Tablet) and Robert Mickens (La Croix International) giving their perspectives on Pope Francis’ Church reform strategy, not least following the recent Vatican Sexual Abuse Summit. They were also addressed by the American moral theologian, Professor James Keenan SJ, on the Pope’s response to the 2014/2015 Synods on Marriage & Family. He focused on Pope Francis’ key-principles of ‘accompaniment’ and ‘moral discernment’ as vital considerations in addressing LGBT concerns. As our blogger, Westminster Fly, who sent me this news wrote: “The Westminster LGBT brigade are untouchable now…” And he threw in an additional short report for good measure. Click here to read it. Photographed below, Pope Francis greets the LGBT+ chaplain, Fr David Stewart SJ. IVF: Legal Gender Selection Looming? Britain is a global leader in assisted reproduction. Four decades ago, it was a British team that pioneered in vitro fertilisation (IVF) treatment, resulting in the birth of the world’s first test-tube baby, Louise Brown, in July 1978. The Mail Online report goes on to bemoan the fact that this supposed great “new knowledge” can be “harnessed for negative purposes” – citing the scandal of UK doctors caught by undercover reporters illegally providing gender selection. However, what’s the bet that what the Mail Online today thinks is “negative” and is rightly illegal, tomorrow will be advertised as a wonderful advancement which must be allowed in law? Gimme strength; that’s my opinion! What’s yours? And what about your priest? Bishop? They need to preach against this sort of attack on the natural order, to inform Catholics who are as ignorant about the (im)morality of these contemporary scientific “advancements” as everyone else. Share your tips on how to pray the Rosary well. And any stories you wish to share about the power of the Rosary are most welcome! Let’s remember, too, to pray for the repose of the soul of Father Nicholas Gruner, in this month of the Rosary. Eternal rest grant unto him, O Lord, and let perpetual light shine upon him. May he rest in peace. Amen. Pope Francis: is it spiritual blindness or sheer idiocy that prevents him from seeing the need to ACT… NOW?! Can We Read Our Way To Heaven? Just wondering if we could perhaps start another topic on what our bloggers are reading at the moment? Spiritual reading that is. I could start off by saying that I am loving Cardinal Sarah’s book on Silence. It is beautifully written, perceptive, and does bring home the need for quiet in this clamorous world of ours.